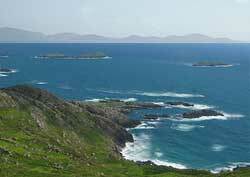 The Ring of Kerry in Ireland is one of Europe's most famous and scenic drives. You view craggy coastlines and verdant rolling hills dotted with sheep. The Ring of Kerry has a serious shortcoming: In the last couple of decades it has become severely overcrowded with day-tour busses during its peak summer season - to the point where this overshadows the natural beauty. That's the reason I lowered the Ring of Kerry from a Silver to a Bronze Medal. The best vantage of these picturesque Killarney National Park mountain lakes are from the Ladies View outlook. Period-piece furnishings in a 15th-century mansion.